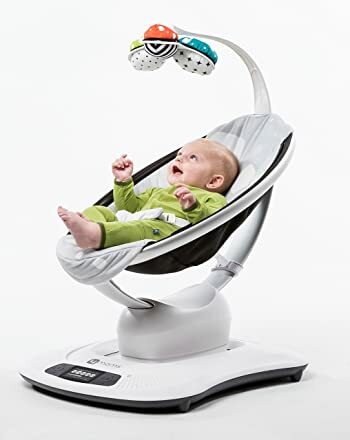 This contemporary baby swing features Bluetooth enabled operation. You can control the motions without having to switch or even adjust buttons and knobs. The sound is very critical, and it can also be controlled via Bluetooth. With this swing, you will just control the various operations from a far distance without losing concentration on other activities. 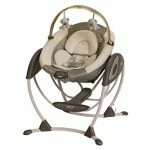 The 4moms mamaroo baby swing is designed to ease your baby nursing program. It’s the best swing that for those who love digital products. Most people are used to the common baby swings that come with only two swinging motions. This baby swing comes with 5 different motions with each tailored to offer a comforting feeling just like the mother would do. These motions include Kangaroo, tree swing, car ride, wave and rock a bye. Therefore, you child will have the same comforting and soothing experience as if in the parent’s hands. 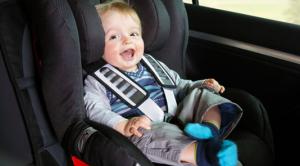 A head-to-toe and side to side swing can’t offer a similar experience to your baby. When you choose this baby swing, don’t worry about your kid’s entertainment. It comes with several entertainment features. 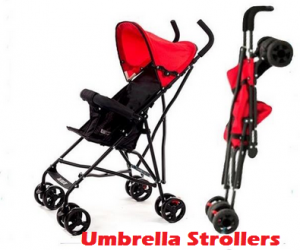 First it has overhead toys to keep your child engaged. These toys also create a great natural like viewing that your baby would experience when in your arms. Then there is built-in sounds and MP3 plug-in. You have the option to select from four soothing sounds; you can also play music directly from your Smartphone or other compatible devices. You child will have exceptional entertainment when in this swing. 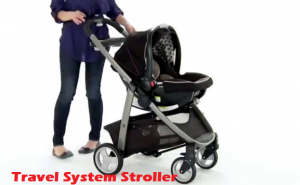 Safety and comfort are two components that each baby swing should posses. 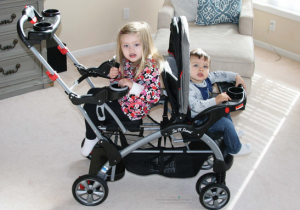 The 4moms mamaroo comes with an adjustable seat recline to ensure unparalleled safety and comfort for your child. 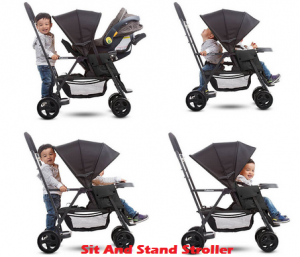 You will have different positions to secure your child when you choose this swing. 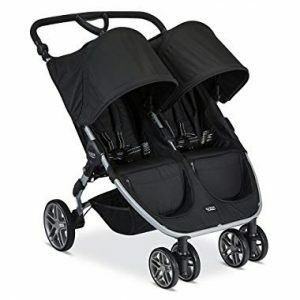 It also features beautiful thick padded seat for enhanced comfort and safety. This swing is built with coziness and comfort in mind, and it’s a great option for those who have babies of less than 20 pounds. However, note that it is perfect for use from birth. 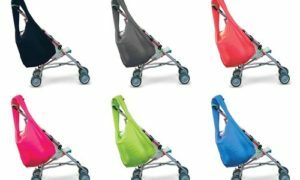 This baby swing weighs only 14 pounds, and it folds compactly for easy storage and transport. It is also relatively smaller but roomy since it measures about 26.2 by 9.2 by 22.5 inches. Hence, it is perfect for moving. 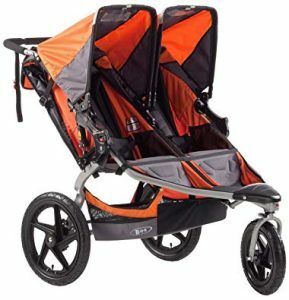 This baby swing doesn’t occupy a lot of space in the house when storing or your car when transporting. This baby swing is made of 100% polyester making it very beautiful and durable. It’s comes in 7 neutral colors making it a unisex unit. The colors include classic black, silver plush, multi plush, designer plush and classic grey. You will have the option to choose the color that matches your theme. A great aspect of this swing is that you will see all operations through an LCD screen. 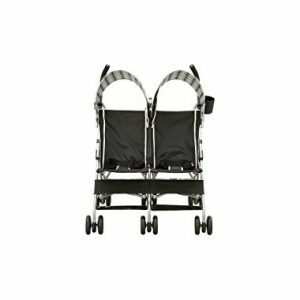 The 4moms mamaroo baby swing is one of the most superior baby swings available in the market today. It comes with contemporary features that are meant to make your nursing easier. 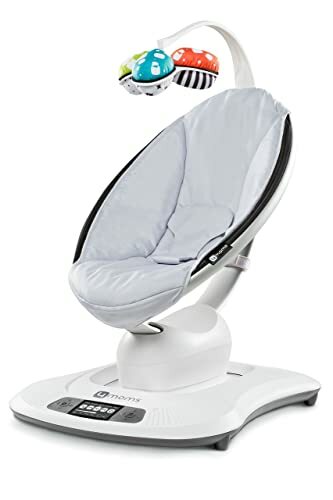 Thus, it is a great baby swing for those looking for Bluetooth enabled operation, 5 motions, MP3 plug-in and beautifully padded seat inserts. Some people argue that it’s a bit expensive, but this swing has become popular in the market due to its exceptional features. 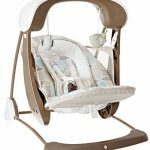 The 4moms mamaroo baby swing review is all that you need to make a decision. Final verdict, it’s a great investment.